Looking up Edward Street: the Dog Tray pub was on the left. It had a sign that said ‘No Dogs’. Click on an image to open a large view in a new window. The widening of Edward Street was done over a couple of years; the first stage was done in 1962/3. I worked in the Borough Surveyor’s Department then. Work stopped for about six weeks due to the cold and snow, the worst winter on record. There were other problems; the Dog Tray public house projected beyond everything else and forced us to make a very narrow footpath. The Southdown Bus Garage exit forced us to change the camber on the road, so the buses did not scrape their overhangs as the wheels dropped into the gutters. In one of the side roads to the east of the Law Courts, there was slipping and the fracturing of a gas main to slow us down. Finally, one of our workers managed to put a pickaxe through the main electricity feed – twice. A third time it was cut by a JCB. My son drove me to Brighton in December 2002 so he could get some running shoes. We parked by the Law Courts and walked across Edward Street. It was the first time I had revisited since I left Brighton in 1963. It was a strange feeling indeed, 40 years on. 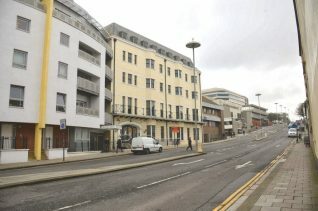 Do you remember the widening of Edward Street? Maybe you remember the Dog Tray public house? If you can share your memories with us, please leave a comment below. 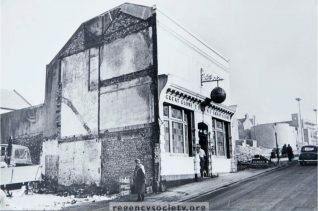 The comments above are not referring to the pub in the 1965 image. That is the Great Globe (the Little Globe, no longer a pub, still exists across the road). The Dog Tray pub was much nearer the bottom of Edward Street. The name refers to the dog’s name – Tray- and was a name mentioned in a Shakespeare play. Widening of parts of Edward Street took place much earlier in the mid-late 1930s as part of the slum clearance work in that part of Brighton but it was interrupted by WWII.